We’ve written a lot of popular topics covering individual funnels of the SaaS customer lifecycle, but it is time to think big picture. How? By bringing it all together and looking at the customer lifecycle as one big funnel. Below is a must read for any SaaS company at any stage. Let’s get started. What are your trial to paid conversion rates? What does churn look like? Turns out, there were other obvious issues. Throwing more money at marketing was a bad idea until the subscription business optimized converting more of the customers that were already coming in and worked on “stopping the leak” through reduced churn. Spending more on marketing would have just been a waste of money until the other items were addressed. This isn’t the first time that’s happened. While it seems pretty intuitive, when I explain the importance of the whole customer lifecycle funnel, I typically get a response like “ahh, that make so much sense” or “you’re so right, I wish more people understood this.” Which is precisely why I’m writing this blog. To build a successful SaaS business, whether you are B2B or B2C (but especially B2B), you need to look at the whole funnel and optimize key metrics within each portion to create a well oiled machine that can thrive. Every “unicorn” has mastered the whole funnel, are you ready? Unfortunately, your funnel will never look like this. Not everyone that visits your site will sign up, not everyone that signs up will convert, and not everyone that converts will remain a loyal customer forever. 1. Acquire: Bringing in a ton of traffic is great, but it is only truly great if you’re attracting the right traffic that is interested in your product. Tons of traffic and lackluster signups (or whatever conversion event you define) can mean you’re marketing to the wrong customers, there are issues with the product/market fit, or your website lacks perceived value. 2. Engage: You’re getting solid traffic and getting users into the conversion funnel, likely through a free trial. Great! But are they completing mission critical steps to extract value out of your product/service and becoming paid customers? If the answer is “no,” you might have issues with your onboarding. Or there could be a misalignment of your website’s perceived value and the product’s true value which is causing potential customers to abandon ship. Fixing these issues will yield much higher returns from marketing spends so consider it a gift that will keep on giving. 3. Retain: Acquiring new customers is much harder (and more expensive) than retaining existing customers so don’t make the mistake of ignoring the customers you already have! Ideally you want to prevent churn before it happens by providing amazing customer success and support, and identifying red flag metrics to proactively reduce churn. Are there key features you’re missing? Was service unreliable or buggy? Are customers going to a competitor? The takeaway from the information above is that truly successful SaaS companies don’t operate in silos. Marketing, sales, product, customer success, and support are all important pieces of the puzzle, but “winning” requires cross-functional team collaboration to optimize each portion of the customer lifecycle funnel. Monitoring and optimizing the following metrics will help you and your team get one step closer to “unicorn” status. Each of the metrics below could have an entire blog devoted to it, so my goal here is to highlight some of the key metrics you should be aware of for each portion of the customer lifecycle funnel. This isn’t an exhaustive list and every business is different so there will be other unique metrics that are critical to your own company’s success. Remember what I mentioned earlier: in the acquire portion of the funnel it isn’t just about driving traffic, but the right traffic! Acquisition metrics help you identify the best sources of traffic and the costs associated with each customer acquisition – both ideal and real. You can compare your ideal and real customer acquisition metrics throughout the lifecycle of your company to ensure you’re optimizing the right marketing channels in order to acquire the best traffic for your product/service! New Visitors: The number of new eyeballs visiting your site. Channel Specific Traffic: You’ll want to measure/track traffic being driven through each channel – direct, referral, organic, social, and paid channels. Total Conversions: How many people complete the conversion events you’ve defined such as start a trial, fill out a form, or download a whitepaper. Be careful not to confuse total conversions for acquisition with paid conversions outlined in engage section below. Visitors to Conversion (or Signup) Ratio: The percent of visitors that complete the conversion event listed above (again, don’t confuse this with conversions in the engagement section below). Once you’ve determined the ideal CAC for your SaaS business, you can test different marketing mediums. For each medium, if its CAC is below the CAC the calculator provided then you know it is a good CAC number. Keep doing what you’re doing with that medium! If a marketing medium’s CAC is above the ideal CAC, you need to improve these campaigns or move on and test something else. Engagement is all about onboarding and customer success. The focus is on getting users to complete mission critical steps to become happy, loyal, paying users. After you define the critical engage metrics for your company, you’ll want to take benchmark measurements and then increase those metrics by improving onboarding and communications. First Session Length: The time frame a user interacts with your product in their first session. Returning Sessions/Visit Frequency: How often a user returns to interact with your product or service. Of course, every business will have visitors who sign up and then don’t log back in for days, weeks, or ever. You can use tools like Intercom to automatically communicate with these users and offer assistance to bring them back. They realized they needed to optimize their onboarding communications. 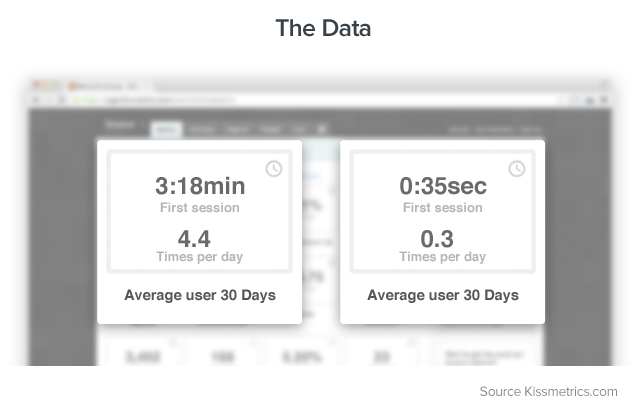 By sending “targeted emails to users who spent less than 2 minutes on their first session, as well as to those who (regardless of first session time) logged in fewer than 2 times a day in their first 10 days,” Groove was able to significantly reduce their trial churn. That’s the power of engagement! Core Tasks Completion: These are the core tasks/activities that a user needs to complete to get the most out of your product (one of the most important metrics in the SaaS customer lifecycle funnel!). Trial to Paid Conversions: The percentage of trial users who convert to paying customers. This is really what is all boils down to. Remember, don’t confuse the conversion to paying customers (here) with the “visitors to conversion ratio” in the acquire portion of the funnel. They are two distinctly different metrics. DAU, WAU, MAU: (most basic engagement metrics) “Daily, Weekly, and Monthly Active Users, that is the unique amount of users who are “active” within a given amount of time,” according to Popcorn Metrics’ Paul Boyce. Retention really boils down to churn. You already know providing awesome customer success and support are key to retaining happy, loyal customers. Below are a few additional ways to be be proactive and avoid churn. Activity Churn: Indicated when you see a “drop in usage across an entire team” from previously active users. “It’s acceptable for one user from a team to disappear temporarily; it’s when the activity of an entire team is dropping that you worry you’re losing a customer,” says Intercom co-founder Des Traynor. A drop in use by an individual team member can simply indicate they’re enjoying a holiday away from work! Cancel Intent Behavior: An action indicating they’re thinking of cancelling such as removing your widget from their website, mousing over the cancel button, or telling support staff they intend to cancel. Any cancel intent behavior “should trigger appropriate intervention to try to move them back on track toward achieving their Desired Outcome,” writes Lincoln Murphy. Past Due Accounts: A past-due or failed payment attempt is an indication of churn potential. Reducing churn is fantastic, but no business can completely eradicate churn. Customers are going to churn for various reasons. The following aren’t metrics, but they allow you gain knowledge from churned customers in order to combat future churn. A cancel flow is “an off-boarding workflow that allows them to cancel in-app if they want but reminds them what they’ll lose if they do and gives them another, compelling option other than cancelling [such as downgrading to a lower priced plan],” according to Murphy. He points out sometimes just having the option to cancel in-app is all a user needs to feel more comfortable with your product. When Groove tested exit surveys with close-ended and open-ended questions, the survey with an open-ended question had dramatically higher response rates. They even found that changing the question from “Why did you cancel?” (10.2% response rate) to “What made you cancel?” (19% response rate) made a significant change in users’ willingness to respond. Murphy also advises making the survey about them (something like “Tell us about your experience”) instead of a request like “Tell me what we can do better so we can…” which makes it about you. Once you have churn under control, the key retention metric for growth is Expansion MRR. Expansion MRR: Increased revenue from upsells and cross-sells. As we explained in a previous blog, happy, paying customers make ideal upsell candidates. Once a customer is fully engaged and has extracted value from your product, they are more likely to upgrade for advanced features and functionality. Expansion MRR allows you to work towards negative churn! Negative churn occurs when upgrades and up-sells are greater than what is lost by cancellations and downgrades. Want to learn more about negative churn? Check out this great post from Tomasz Tunguz. Understanding the customer lifecycle funnel and key SaaS metrics is great, but in the end you want to see the results. So let’s look at an example to see what all these metrics look like when improved individually vs as a whole. The biggest individual improvement came from increasing the visit to signup ratio by 1% OR trial to paid conversions by 5% — both of these increased MRR by 29.2% over the course of 12 months. But all of the improvements combined almost doubled (96.3% increase) MRR over 12 months! Please keep in mind that these are simply theoretical numbers, but they are not far off from many SaaS benchmarks you may see. 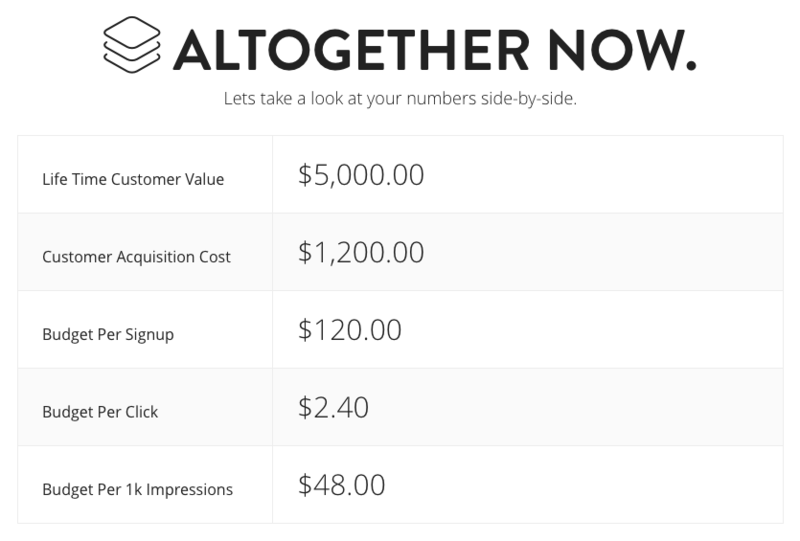 Don’t get hung up on the baseline numbers as much as the big picture: All the individual improvements move the needle in the right direction, but all of them combined have a HUGE impact on revenue growth. The final takeaway: It is easy to only focus on one portion of the SaaS customer lifecycle funnel, but don’t let tunnel vision distract you from looking at the bigger picture. Directors and leadership must unite to understand all key metrics across the entire funnel. While all the metrics are important to optimize, sometimes your biggest growth levers may not be your biggest priorities – you can change that!